St.Armands Key is an island in Sarasota Bay off the west coast of Florida on the Gulf of Mexico. It is located only 5 minutes from downtown Sarasota and is connected to the mainland by the beautiful John Ringling Causeway. 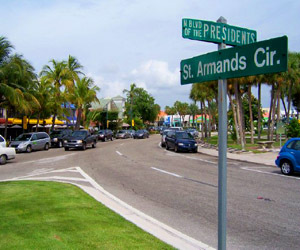 St. Armands Circle, a shopping center with more than 130 stores. It attracts tourists and residents alike and provides an unforgettable experience for visitors from all over the world. 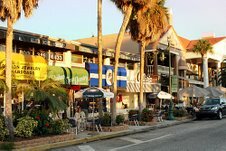 Renowned as a market place with a continental flavor, this historical district features tropical landscaping, courtyards and patios, antique statuary, unique galleries, and outdoor cafes. Explore exclusive shops - from trinkets to treasures, galleries, exotic boutiques; relax in restaurants and gourmet snacks to candlelight feasts, you'll find it all on St. Armands Circle. The area is famed for its home-made chocolate fudge and ice-cream shops. An average year round 75-degree temperature makes this beautiful island very conducive for just about anything. Vacations are perfect opportunities to explore potential Ideal Places to Retire. Contact a local real estate agent or visit the Chamber of Commerce for more information. While you’re there, remember to visit The Circus Ring of Fame around the Central Park.